I’ve been a father for thirty-four years, which means I’ve been the singular object of my family’s affection for at least one day on thirty-four occasions. 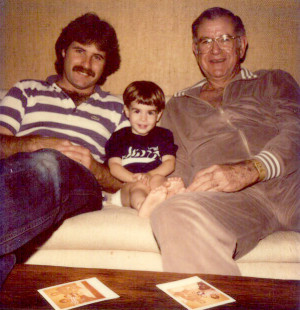 When my father-in-law and my father were still alive, I’d usually wake up to a sweet Father’s Day welcome and then drag myself, my kids, and our parenting gear to various parts of town to celebrate first with my dad, and then with JoAnn’s dad, my father-in-law. In those days I learned to defer, allowing our fathers to stand and revel in the glory of having created my wife and me. Simply put, I understood I was not the Dad being celebrated at those events. It wasn’t hard. Both our Dads were funny and grateful for their hundredth tie. No matter how dorky the gifts, they were always pleased to be getting them, especially from their grandchildren. I had a tradition of telling my Dad a joke — because making him laugh was the best gift I could ever give him. As we got older, I always took the time to thank those Fathers-before-me who had worked so hard to set an example, keeping a roof over our heads and helping us feel as though things would always be okay… even if they wouldn’t. The perspective created by time and my own experience as a father makes me even more grateful to those who came before me. No Dad is perfect, but Father’s Day was and will always be a day for gratitude. As for my family, whenever possible, I used Father’s Day to lovingly impose my will. One year, after a spontaneous double-header, JoAnn vowed to never attend another Sunday softball game. As a result, my softball buddies and I used to deem Father’s Day “Fan Appreciation Day” to coerce our families into coming to watch. We’d typically take the team picture that day, and hopefully give the kiddies a good show. It worked like a charm, but our tradition ended when the league got flack for scheduling games on Mother’s Day. Father’s Day games were eliminated because of “equality” or some such thing. That left us with a clean softball slate on Father’s Day Sunday. Dads usually get a lot done on Sundays. Basically, the “Day of Rest” is the day when all of the work I postponed around the house comes due. The garage gets cleaned out, the car gets washed, the backyard furniture gets wiped down, light bulbs get changed, appliances get fixed, drains get snaked. You name it, it can happen on a Sunday. But not on Father’s Day. The beauty of Father’s Day is that it’s my day. I choose my favorite meal (if my wife feels like making it). I choose the music in the house (if it’s not too early). I choose to watch golf on TV (because nobody really cares) and I get to have my kids around me (if they’re in town). On Father’s Day I’m allowed to summon my children and have the expectation that they’ll actually come over and hang out with me (as long as we feed them). These days my kids are pretty good at giving gifts. Unlike the father’s that preceded me, I have not achieved the “What do you give the man who has everything?” stage of life. I still love toys. Not Porsches or those types of material toys, but I generally yearn for a catalog-purchase quad copter, a new softball bat, or basically anything you’d buy a twelve year old. I’m easy… and I don’t wear ties. Unfortunately, we no longer share the day with the generation before us. There will certainly come a time when our children become fathers, but until then all I really want for Father’s Day is to be in the company of my family and to laugh so hard my Dad can hear me. My kids are like I was. They know I don’t really care about “stuff,” and that their best gift is to tell me a good joke (which they do all the time)… and maybe order me a quad copter from Amazon. Four children later, I ‘m here to tell you that life definitely changes after children and here are the type of changes a Dad can expect. They are all wonderful. Or, at least it’s important to think of them that way, because sacrifice is the key to strong parenting. It’s best to get used to it early. Let’s start at the beginning. During our first pregnancy, I returned home from work one day to find my calm and patient wife, JoAnn, sitting on the bathroom floor crying. When I asked her what was wrong, she looked up at me in tears and said “I don’t know.” Then she started laughing hysterically. After that, there was no question in my mind that we were entering new territory. Once our first child was born, things got busy all the time. With the births of our three subsequent children, JoAnn or I (usually JoAnn) spent the next ten years being pulled out of bed to tend to the needs of a child. Whether it was a bad dream, upset tummy, need for water, actual illness, or something inconceivable, being a parent means going from REM to reality in nanoseconds. I have assembled hundreds of baby-related devices, all designed to simplify a parent’s life. Finding these heretofore untapped skills has been both a pleasure and a curse. One thing I’ve learned for sure is that following directions is the most efficient path between taking that stroller out of the box and having a useable, safe, parenting aid. Yes, you may have some parts left over, but “they always give you extras.” Although JoAnn and I have always been equals in our parenting process, it’s also proven helpful (and efficient) to follow her directions as well. Be prepared to lug everything everywhere. Now that you’ve assembled the stroller, and you’ve collected all of the items necessary to adequately fill the “baby bag” – code for life support system – you will always be responsible for getting them from point A to point B. You will become an accomplished packer. You will, essentially, become a Sherpa. Know it. Own it. Love it. “They just can’t relate.” That’s what you’ll tell yourself. Your friends, the Poker guys, the after-work crew, the frat brothers, the softball team — your relationship with them will become conditional. At first, you’ll feel badly about having to leave your guy events early in order to take your kid to a birthday party but, over time, the landscape of your friendships will evolve. Those who “get it” will still be part of your life (or lives (including your spouse and children), and those who don’t will drift away. It happens. Once they have kids, they’ll be back in search of advice. That’s right. Even though our children are often more needy than we ever thought anyone could be, we get to have these moments when look in their eyes or hold their hand and suddenly realize it’s the most special moment ever. These connected opportunities will change over the years but, when they happen, they’ll remind us of why we’ve lost all that sleep, lugged all that crap, and sacrificed a hunk of our independence in order to be their parent. The dividends are substantial. JoAnn and I have “launched” our four children. They like and care for each other. They go to work. They please their bosses and co-workers. They laugh a lot, and they make us laugh a lot. Ultimately, we realize that what prepared parents have in common is the pure pleasure of watching their children evolve from the helpless creatures we bring home from the hospital, into the walking, talking, opinionated people who enhance, enrich, and, yes, change our lives forever.